Chris Rosser is author of The Weaver's Boy Book 1, The Lords of Skeinhold fantasy series. He is a technical writer, web developer and blogger living in Melbourne, Australia, with his wife and three kids. I kick off my 31-day marathon to finish Weaver of Dreams and commit to journal my progress. This is Part 1 in the series, Weaver Marathon. To complicate my life I've decided to journal my progress during my self-imposed marathon to the finish line. At the end of each day I'll summarise what I've done, show my word count and maybe bare my soul in the process. Self-indulgent, sure, but hopefully it will keep me on track and honest. 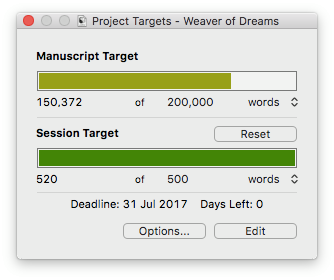 Last night, as a warm-up before today's event, I reviewed my notes in Scrivener and decided to finish off the prologue. It's been half-written for more than a year but I reached the point where I needed to finish it because the events that occur there affect both the main plot and a substantial subplot particular in Act 3. Originally, I only intended to outline a summary of what I was going to write today but I'm glad I deviated from my plan. I wrote just over 500 words and got something finished. The session also carried me over the 150,000 word mark giving me my starting point. I start today, with just under 50,000 words to write. Over lunch today, I roughly pencilled out what I want to do in my session later tonight. I also thought about a general strategy to help get me to my end goal, the finished manuscript. Turns out, it's not that dissimilar to my Nanowrimo strategy so it will be good practice when I write a new story later in November. Review but don't edit the previous day's work. Scan through the project and notes for loose ends and low-hanging fruit. Outline the scenes I plan on writing in the evening. Point 1 Typically, I'll do this first thing on the train during my morning commute. My device of choice is my iPhone or iPad mini, both of which have Scrivener for iOS. I've thought about taking my laptop but it would be a waste because I rarely get a seat as Melbourne's trains are so crowded. Point 2 After reviewing the previous nights work, I'll zoom out and take an avian clichéd view of the project. Taking inspiration from GTD, if I see low-hanging fruit (like a short unfinished scene) I'll finish it there and then. Otherwise I'll scan through my notes and use them for Point 3, planning and outlining what I want to write that night. Point 4 is easier said than done but just as with Nanowrimo, if I stop then my goal will slip. If I get stuck with something, I'll move on to another scene. If that doesn't work, I'll draft some notes or flesh out an aspect of my world or characters that's pertinent to the story. Hopefully the act of note taking or world building will clear the creative cobwebs and provide material for the next session. What I won't do, even if I'm really stuck is rewrite anything I have already written; this month is all about drafting and not revision. Revision is all about cutting, analysing, crafting and structuring — it will come later. Also, in the spirit of Nanowrimo I will only count words written in the manuscript.